diary of a crazy person: Meet My Animals! I am sure I have talked about them before, but just for fun, here are my animals! Fleury is a 3 1/2 year old Chihuahua. Everyone wants Fleury. She is the sweetest dog in the world, she would never hurt a fly! She is gentle and quiet and great with kids. My little cousins often haul her around, and she lets them with no fuss. She is a shy dog, hard to train to do tricks, but she is very loyal. When we left for Europe she missed us so much she didn't eat properly for a while! We drove all the way to Texas for her, and she was worth every penny and minute we spend doing it. Eric has been quoted to say, if every Chihuahua was like Fleury, he wouldn't mind 10 in the house! Her breath smells bad, she she licks her feet all the time. I think she might have allergies! 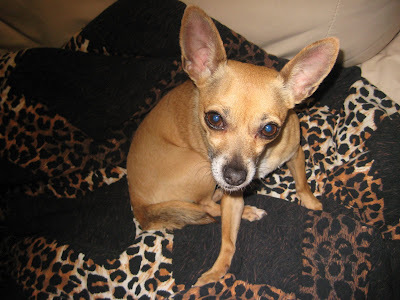 Remy is a 2 1/2 year old American Kennel Club registered Chihuahua. Nobody likes him but me! He is loud, obnoxious, he looks like a gremlin and he pees on things because he is intact. Nevertheless, he is very sweet, and all he wants is someone to give him love. He is very eager to please. He is very smart and VERY easy to train. He is so tiny, just 4.5 lbs, and he lets you do almost anything to him. He doesn't like kids much, cause my brother teases him. He has the cutest prance when walked on a leash. He would probably be a great show dog! Despite all his flaws, I adore him. He is a heartbreaker! He is from a breeding in Southern Minnesota. He lives with my mom most of the time. 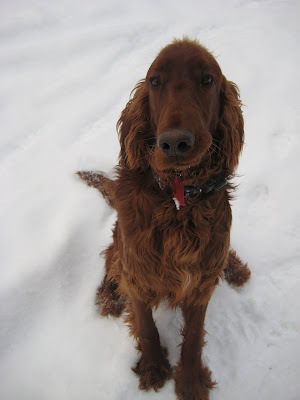 Finnley is a 2 year old Irish Setter. He is FULL of energy and very rambunctious! He loves attention and getting scratched. He can run for miles and not get tired. Bike rides are his favorite. He loves food and will eat almost anything. He destroys stuffed toys in seconds! He is stubborn but very intelligent (true to his breed). He loves people, and is great with kids unless they are small enough for him to knock down. He does not usually like new dogs and will sometimes try to attack them, but he is getting better at that! He hates the Chihuahuas, especially Paris and Remy, so they have to stay seperated all the time. :( I am taking him to agility now and he loves it! We got him from a breeder near Detriot Lakes, Minnesota. 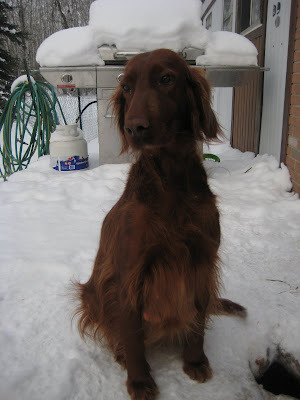 Maeve is a 5 year old Irish Setter that I adopted from work. Her old owner brought her in to put her to sleep because she ran away too much and didn't like her new puppies. Well she is the best dog in the world! She tolerates the Chihuahuas being mean to her and kids tugging on her. She is very smart and easy to train. It took her a long time to build trust with us, because she had bad experiences before she came to live with us. She sometimes shies away from new people, but she is NEVER aggressive, unless she is putting Finn in his place! She had 11 puppies last year and she was a great mom! 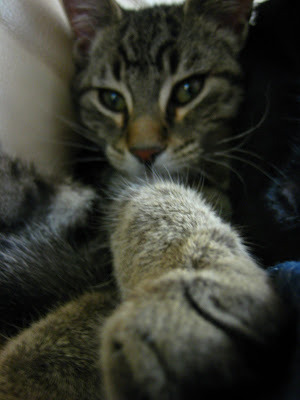 Sevens is a 5 month old male tabby cat who I adopted from work. He is the newest addition to our family. He was supposed to be an outside cat, but he has totally stolen my heart and is mostly inside. He does go outside quite often and he loves it. He is a very cuddly cat, and loves to be held like a baby. He likes to lick noses. He and Fleury are best of friends, and play fight all the time. It is so cute to watch them. He is very picky and will only eat his own cat food, and not the dog food, which is actually really nice! Paris is a 4 1/2 year old Chihuahua and was my wedding gift from Eric. We bought her in Minneapolis on our honeymoon. She is a great dog. She is very smart and easy to train. I am taking her to agility classes and she loves it and is really good at it. She knows lots of different tricks. She is a very sweet, loving and loyal dog. She likes to run through the bush and explore by the church and the school, even though she is not supposed to! Remy is over for a visit now, so hopefully Paris will be having babies in two months! She is a fantastic mother! 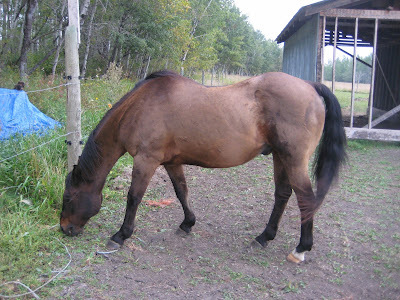 Chai is an approximatley 20 year old Quarter horse I rescued from the meat market. He was bought as company for Zaiyah, but has turned out to be a solid riding horse! We had a few issues in the beginning because all he wanted to do is go home, but now he is great! I am so grateful to have gotten him! Zaiyah is my very first horse! She is almost 7 years old. She is very sweet and she loves people, but it takes her a while to build trust. She went for training in the spring, and was doing really well and I was loving riding her. Then we had one rough ride and I have been scared to get on her ever since. I have taken her on one trail ride since, and she was good towards the end. But I just haven't got the nerve to get back on her without Kathleen around! 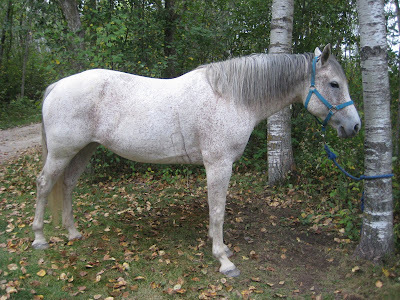 She is for sale now, because I need another horse I can trust as much as Chai. But then again maybe I should just keep her and ride her in the arena for a while before taking her out again! I really do love her! Ha! best comment ever Jared. Finn is my favorite.